← Will The Cargo Saddlebag Work On Crossovers With Sloping Rear Hatches? When a vehicle is designed to be fuel efficient, one of the first trade-offs is decreased cargo space. Adding a car top cargo carrier increases your cargo space, but it also lowers your vehicle’s gas mileage. Our suggestion for maximizing cargo carrying space while maintaining your fuel efficiency would be to use a Rightline Gear Cargo Saddlebag. Our Cargo Saddlebag increases the cargo capacity of your vehicle by 13 cubic feet. Since it sits behind the vehicle in the slipstream, it does not have the same impact on fuel efficiency as a car top carrier does. While the Prius is not listed in our Carrier Fit Guide as a recommended vehicle for the Saddlebag, it fits well on a standard Prius, as you can see below. The saddlebag would fit even better on a Prius V since it has a more vertical hatch. The saddlebag will also work this way on any other hybrid with a rear hatch. The saddlebag attaches quickly and easily to your roof rack. If your vehicle does not have a roof rack, using our Saddlebag Car Clips keeps the saddlebag securely attached to your hatch. If you have any other questions, or clever cargo carrier uses, let us know. 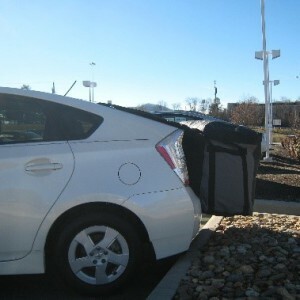 This entry was posted in Cargo Saddlebag Tips and tagged Cargo Saddlebag, Rightline Gear, Hybrid, Toyota Prius. Bookmark the permalink. I have a Prius C; I measured, and my tail lights are more than 40 inches apart, which is the minimum distance necessary for the rear cargo saddle bag…however, I have a spoiler and a rear window wiper, unlike the standard Prius pictured above. (Though the hatchback of the C is less angled than the original Prius). Re: the wiper/spoiler, will either of those pose a problem? We have another blog post that tells all about our experience with rear spoilers and the Cargo Saddlebag: http://rightlinegear.com/blog/cargo-saddlebag-tips/the-rightline-gear-cargo-saddlebag-and-suv-fairings/. Most of the time when using the Cargo Saddlebag, it is not possible to use the vehicle’s rear wiper. The Saddlebag will not damage the wiper in any way.